Agencies and printing companies are increasingly faced with the prospect of using QR Codes and other 2D barcode formats in their customers' collateral, signage, advertising, and other products. As smartphones become more popular, the use of 2D barcodes will only increase. Businesses looking for ways to add to their knowledge base, increase their reputation for innovation and, most importantly, reduce the risks of adopting a 2D barcode strategy are turning to PRINT2D for help. Our response is a new certification program aptly named 2DCertified. 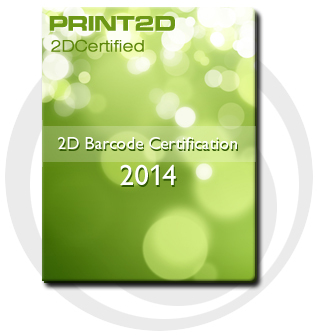 2DCertified is designed to help agencies and printers succeed with QR and other 2D formats. The 2DCertified program is a concise training program on the technical requirements for printing viable "tags" (the scannable barcode images) for optimum performance on smartphones. It also includes a procedure checklist for 2D barcode reproduction that guarantees success when followed. During training, the instructor will cover not only the technical requirements, but also the best practices for using 2D barcodes in the first place-like having a mobile-friendly landing page, and making sure there are meaningful mobile responses that make the campaign effective. Talk to us about how to make your use of 2D barcodes a "plus" for your customers and make your company an indispensable partner in their ongoing marketing efforts. 2DCertified Professionals, also receive priority placement in our annual PRINT2D integrated media partners directory. Please call us at (424) 229-1404 ( M to F 9AM to 5PM PST) to get started or fill in the form found here and we'll be in touch promptly.